Kiwi FOO Camp (www,baacamp.org) organised by Nathan Torkington was a fantastic event - thanks for the invite Nathan. The content was great, many inspiring discussions, lots of energy and subsequenlty many thoughts and ideas that I will continue to post on over the next few months. Big outtakes: everyone in IT is engaged in design at some level; as designers we can learn a lot from open source communities and this has enormous potential for big design probelems like sustainability; usability, UX design, interaction design require clear context for useful discussion, even amongst experts, I was involved in a discussion where we all came at this from many angles and I think we needed to get clear on architypes to have a useful discussion on this (still plenty of opportunities; Hardware hacking is a cool thing and shows so much potential for interesting developmements. FRONT link here is pretty cool, FRONT members have developed a method to materialise free hand sketches. They make it possible by using a unique method where two advanced techniques are combined. Pen strokes made in the air are recorded with Motion Capture and become 3D digital files; these are then materialised through Rapid Prototyping into real pieces of furniture. Lots of potential to use this technology. I can forsee a time when we will all have our local RP centres to print off the odd useful thing ot two, and maybe using different densities and textures of materials etc..
Amazon's new directions. This article in USA Today was interesting. Quote "You can rent space on Amazon's computers to run a business, or rent out its transaction capabilities to sell things and collect money, or rent pieces of its warehouses and distribution system to store and ship items — or all of the above. So, with almost no start-up costs, anyone anywhere could become a retailer". This is a great example of a company that really understands innovation and isn't afraid to put into action. It offers potential to really change the way we think about design of business models and supply chains. QR Codes see this article in the Japan Marketing News where the uptake has been relatively strong compared to elswhere. If you are into marketing certainly worth a try on a few campaigns. The notion of employing a "hyper-rational" design process in the name of creating emotionally resonant experiences and spaces. Using a team-based design process, rather than the more traditional "star designer" model often found in architecture and industrial design. Designing for business by using flexible spaces to enable economic viability now and in to the future. Agree the storytelling is great. 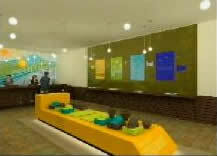 American Apparel are opening a new store in Second Life, a virtual retail space. Springwise report that the store, set on a private island within Second Life, was designed by Aimee Weber, a Second Life resident and designer, in conjunction with American Apparel's own architect. The store will sell 20 familiar American Apparel items for avatars, including the women's jersey polo dress. The company will charge a token sum of about USD 1 per item. It's (surprisingly!) 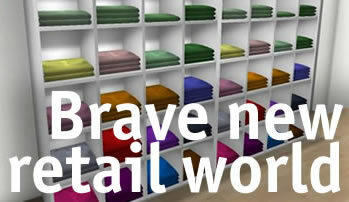 the first 'real world' retailer to set up shop in Second Life. An average bank in the suburbs will do about $1.5 million a month is deposits. In the first 25 weeks with our new branch, we've done $1 million a week. This roughtly translates to, the traditional branch doing about $9.4 million over 25 weeks, versus the $25 million they've done in the new branch. 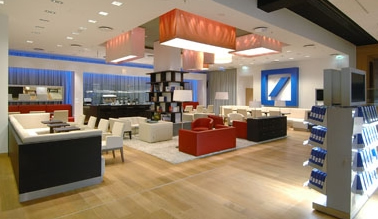 CScouts reports on Deutsche Banks new pilot branch, named Q110. Finally somebody thought about banking of the future and how to present financial services in a more innovative and customer friendly way. In addition to regular bank operations, this distinctive complex houses an exhibition space, a trend shop, a reading corner, childrens play area, and a cafe. Dan Saffer's new book; 'Designing for Interaction'; looks really interesting with a good line up of contributions from many people who's views I respect in the area of Interaction Design: Brenda Laurel, Adam Greenfield, Marc Rettig, Hugh Dubberly, and more. I like what Shelly Evenson has to say about Service Design, link here to see the breif interview. ISDN International Service Design Northmbria hosted a colloquium in March on issues around designing services, and I've finally had a chance to listen to the Podcasts. The speaker line-up included Tim Brown from IDEO, Andrea Cooper from the Design Council UK, Chris Downs from Live/Work, Steven Kyffen from Philips, and Oliver King from Engine Group. Design. I've listed some of the really interesting Podcast sessions below, they are worth listening too. Tim Brown spoke of methodologies for approaching design, including services, and some interesting points on story telling and communicating the stories. Chris Downs spoke of the huge potential and value that can be derived from service design and service systems. Andrea Cooper picked up on some of these points also - we can take a more holistic approach to deliver to peoples needs and desires. More products is often not the answer - and the real value is often 'experienced'; though the service component i.e IPOD the customer adding favourite music. Steve Kyffen raised some good points about the complexity of designing services. They are time based and evolve well beyond the point of sale, and experienced differently every time. It requires new business models and with that new design and marketing mindsets. Better Services, Happier Customers, Oliver King Engine Group. An interesting series of Podcasts from Lunar Design. Icon-o-Cast explores and demystifies the world of design. The latest on 'MAKING MEANING'; is worth checking out. In a market economy characterized by commoditized products and global competition, how do companies gain deep and lasting loyalty from their customers? The key, argues author Steve Diller, is in providing meaningful customer experiences. In this episode of Icon-o-Cast, Lunar's John Edson talks with Steve, a partner at Cheskin Research and co-author of Making Meaning: How Successful Businesses Deliver Meaningful Customer Experiences. 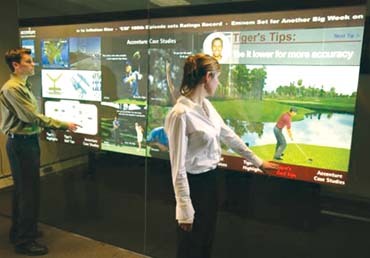 A lot of consumer experiences are mediated through ambient technologies. This article (link below) from UIGarden.net covers some interesting information on the development processes required for the shift from information worlds to experience worlds. This raises some interesting questions about the importance of the psychology of space when information technology is involved. 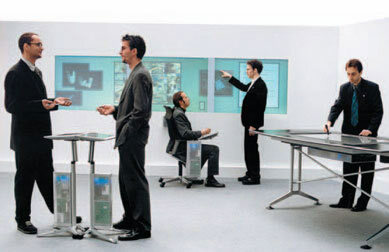 Design approaches to need to consider the activities of the space, and create clear context for the use of the space inorder to create a complete user experience. see earlier weblog on ideo. Dwell time, or experience information on the run. Giant digital touchscreen technolgy taking off at Chicago's O'Hare Airport. Revolutionary for out-of-home advertising and also for inter-office collaboration. If you are ever needing inspiration for how to communicate your complex information networks or just have an appreciation for good visualisation methods, check out the Visual Complexity site. Click on the images for some project background. Cool content.